In Malcolm Gladwell’s book Outliers, he proposes that it takes 10,000 hours of practice to master a skill. If the skill you want to master is writing, what exactly should you do in those 10,000 hours? 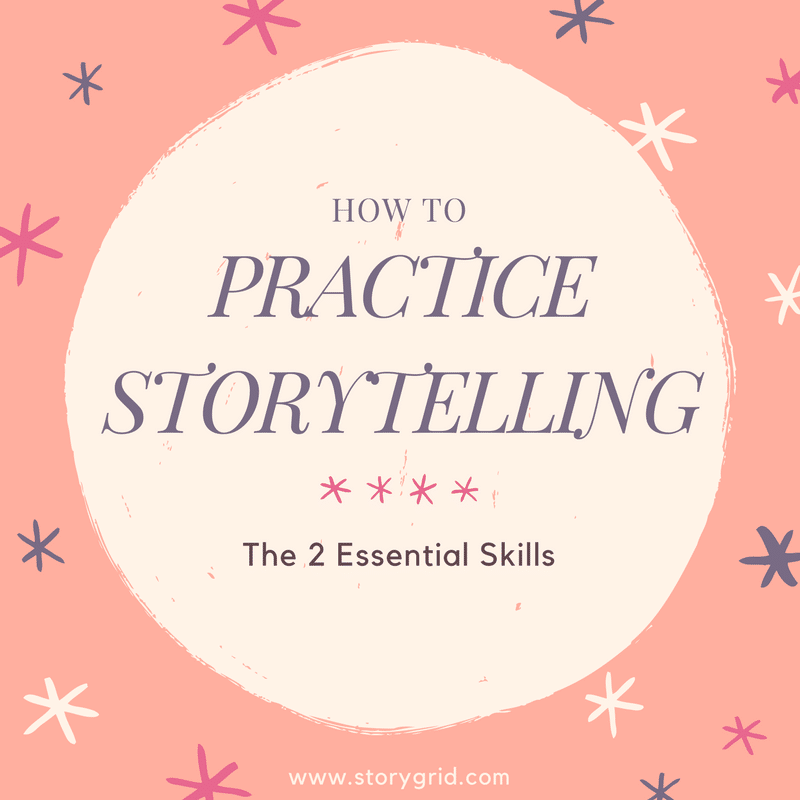 There are two types of storytelling skills that writers need to practice. We’ll define each of those skills, look at when you should work on one vs. the other, and go over ways to practice and improve both. That’s it. Everything else—character development, point of view, plot development, hero’s journey, and more—can be wrapped up into those two categories. If you can do the micro work of writing scenes that start one way and end another, and the macro work of telling a global story that both abides by the conventions of your genre and provides a hook, build, and payoff, you can write a story that readers, listeners, and viewers will enjoy. The most basic unit of storytelling is the scene. An average scene is around 1,000 to 2,000 words. In a scene that works something has changed for at least one of the characters in the scene. What do we mean by “something has changed”? Let’s look at two scenes from Suzanne Collins’s novel, The Hunger Games. In the opening chapter, there are two scenes. In scene one, Katniss Everdeen gets up and goes hunting and scavenging with her friend Gale near their home in District 12. Scene one ends when they sell what they’ve caught and collected around town. In scene two, Katniss and her sister Prim go to the town square for the reaping, a ritual in which young people are chosen to participate in the “Hunger Games,” which will end in death. Let’s look at scene two first. At the beginning of scene two, no one has been chosen to represent District 12 in the Hunger Games yet. Everyone in Katniss’s family is safe. By the end of scene two, that’s changed. Katniss’s sister Prim has gone from safe to being chosen for the Hunger Games. That’s a punch you in the solar plexus shift. We turn the page because we have to find out how Katniss is going to react to her sister being chosen for almost certain death. In scene one, there’s something more subtle happening. While Katniss and Gale are literally hunting and scavenging, the shift in the scene is about their relationship, not the action. Gale asks Katniss to run away with him. She turns him down. He then acts like a jerk. Katniss starts the scene enjoying his company and ends it criticizing him about how he treats the mayor’s daughter. We might say her shift is from friendly to distant. In both of those scenes, something shifts. Prim goes from safe to chosen. Katniss goes from enjoying a friend to criticizing him. Every scene must shift, either through an obvious change, such as life and death circumstances, or through a more subtle change in a human relationship. If you want write a well-crafted novel, the place to start is learning how to write scenes that shift. Only after you’ve learned to write scenes that shift, are you ready to start stringing those scenes together into a larger global story. Global storytelling is what we call putting together scenes into an overall story spine. The structure of your story spine, including the key moments you must include, depends on your genre. Your genre also sets constraints on how your story begins, how it ends and how it arcs in between. 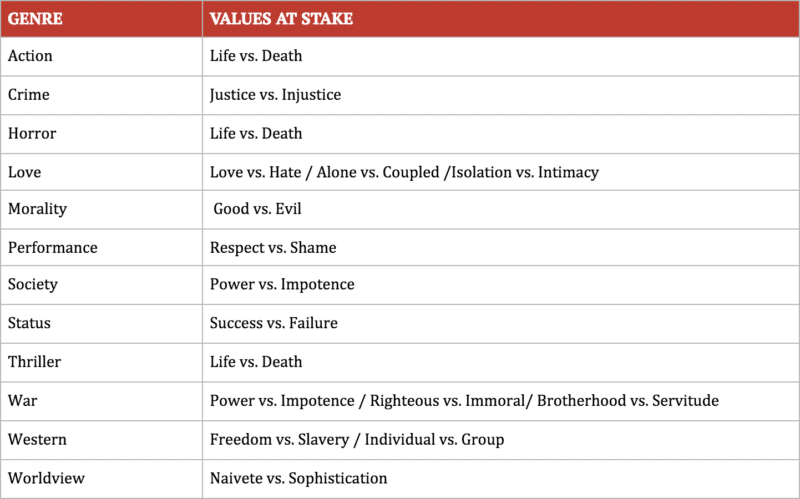 The table below shows the values a global story will arc between for the 12 content genres. Starts with a beginning that hooks the reader, continues with a middle that ratchets up the tension, and finishes with an ending that reaches a surprising, yet, inevitable conclusion. Whether you should focus on scene work or global storytelling depends on whether you’re new to writing, the kind of feedback you’re receiving on your existing scenes, and the results of a simple test. If you’re new to writing, you can stop reading and jump straight to the section on how to improve your scene work on your own. That is the place to start. You cannot write a story that works without writing scenes that shift. Because scene work is the foundational skill of all storytelling, it is the first skill to master. It takes you four paragraphs to explain what happens in a 1,500 word scene. A scene that changes can be concisely summarized in two words, a phrase, a sentence or, at most, two sentences. You give a scene to a friend and they read it. When you ask them to describe the essence of what happens in the scene, they say “I’m not sure.,” “It didn’t go anywhere,” or they go on and on relaying every detail they remember about your scene. If you’re working with an editor, the editor says your scenes “don’t work.” What that means is your scene doesn’t include a shift for one of your characters. Think you’ve got a scene that works? Here’s how to test it. Write down what has changed for one or more of the characters in the scene. Summarize it in a sentence or two. Then give your scene to a writing buddy and ask them to do the same. If you both write similar sentences about what’s changed for one or more of your characters, you’ve probably written a scene that works. Once you’re consistently writing working scenes, your next step to practice storytelling is to start thinking about your global story. If you haven’t mastered how to write a working scene yet, improving your global storytelling will teach you just how important that skill is. You’ll discover that if you can’t make a micro scene shift, your global story shift will be impossible. So if you get stuck on the fundamentals of the scene, start thinking globally. Readers have trouble categorizing your story. While a reader may not be able to tell you that you’ve written a steampunk romantic thriller, they should be able to identify that your story is suspenseful, that there seems to be a romance, or that there’s a historical twist. If they can’t do that, you’ve got a global storytelling problem. Ready to test your global story? Write down three sentences about your story. The first sentence describes what happens in the beginning of your story. The second sentence is what happens in the middle. The third is what happens at the end. Now ask yourself, in those three sentences, has something changed for my protagonist from beginning to end? Next, look at the table for the values at stake in the different genres. Ask yourself, do my three sentences show a shift in the values at stake for my primary genre? For example, if it’s a redemption story, does the protagonist start morally corrupt and become righteous by the end? If you’ve got three sentences that shift between the critical values for your genre, you’ve got the raw materials for a global story that works. Learning any new skill is a combination of doing the right kind of practice (deliberate practice) and learning from the masters at the top of your field. Here’s how to improve your scene work when you sit down to write and what to focus on on when you’re reading the best-written books in your genre. If you’re the kind of writer who likes to plan ahead, here’s how to practice: When you sit down to write a scene, start with an intention. For example, in this scene, I want my protagonist to start out feeling confident in her ability to provide for her family, but by the end, I want her to be unemployed. After you write the scene, evaluate it. Did you shift the scene as you intended? If not, revise. If your writing process is more free-form—you sit down and write what comes to you without prior planning— focus more on evaluating your work after you’ve written it. What specifically has changed in the scene? For whom? Strengthening the mental muscle that helps you identify the shift is one of the best things you can do as a writer. Reading masterworks—the best-written books in your genre—is a great way to get ideas and inspiration for your scenes. As you’re reading a masterwork, pay attention to the scenes in those books. Look at the key scenes for your genre (e.g. the Hero at the Mercy of the Villain scene in a Thriller or the Proof of Love scene in a Love story or the Big Battle in a War story or the Big Event for a Performance story.) What was the shift in the scene? Was that what you were expecting to happen? If the author surprised you, how did they do it? Record ideas you have about how to do similar scenes in your story. What happens next in this story? Does what happened in this scene make sense in terms of what happened before? Here’s a podcast episode where Tim wrestles with those questions for his novel. Once you’ve got a full manuscript, it’s time for a more formal analysis of your global story. For each section of your novel—the Beginning Hook (first 25% of your scenes), Middle Build (middle 50%), and Ending Payoff (final 25%)—you’ll want to see a shift from the beginning to the end of that section. How you check to see if you’ve made the necessary shifts is by putting all the major plot points of your novel onto a single piece of paper. That paper is called a Foolscap Global Story Grid. (Here’s a generic Foolscap.) Want an example of how it works? Here’s a podcast episode where Shawn and Tim walk through a Foolscap Global Story Grid on Tim’s completed manuscript. Ready to learn global storytelling from the master writers? One of the best things you can do is to create a Story Grid spreadsheet of a masterwork in your genre. How do you do that? Here’s a podcast episode where Tim creates a Story Grid spreadsheet of Harry Potter and the Sorcerer’s Stone. If you’re determined to be a top-notch writer, you’re going to need more than practice on your own. While a lone wolf writer might complete a manuscript, he’s also likely to collect a pile of rejection letters or an Amazon page full of negative reviews for his self-published book. The best way to ensure you have more success as a writer is to get specific, targeted feedback on your scenes and your global storytelling. When it comes to scenes, the most basic feedback you need is to know if a scene has a shift, or if it doesn’t. Once you know how to write scenes that work, you’ll want feedback that goes beyond the basics to help you see what’s cliché in your genre and to inspire you to brainstorm different combinations of characters, settings, and scene shifts. If your villain was polite instead of overbearing, would that make your scene more unexpected? Would your Lovers Meet scene seem less cliché if it occurred at boot camp, a VA hospital, or on the battlefield? Can your superhero go from captured to freedom in a more surprising way? How can you abide by the conventions of your genre, yet still surprise the reader? When it comes to global storytelling, a developmental editor can really help. Unless you’ve got a good friend who knows your genre inside and out, you’re going to have a hard time finding someone who can tell you things like “you’re not progressively raising the stakes for your protagonist from chapter 12 onwards,” “you’re missing a Speech in Praise of the Villain scene,” or “all of the supporting characters in your love story are against the pair getting together – you need to add a helper character.” That’s the kind of specific feedback that tells you what is a problem in your global story and what it will take to fix it. So what should you do during your 10,000-plus hours of novel writing? Today we covered the two types of storytelling skills every novelist needs. The truth is, the best writers are constantly switching between those two skills. Working on writing scenes that surprise as well as shift as well as perfecting the best way to raise the stakes for their protagonist, while also honoring the conventions of their genre. They’re challenging themselves to brainstorm more possibilities and getting feedback so they know where to focus during their writing time. How are you spending your 10,000 hours of practice? Do you have an intention before you write a scene? Have you tried the three-sentence exercise or made a Foolscap Global Story Grid for your novel? Share your comments and questions below. I am most excited for this next chapter in the Story Grid mentoring saga!! I also appreciate the blog-type format, broken down with headers — much easier to read for people like me who don’t like to listen to the podcasts. I must admit, I am a plotter and a planner, and I have found that I cannot even begin to dive into writing scenes before I’ve figured out the global story I’m trying to tell. Seems to me the scenes should be written toward what the global story is trying to say, so I am beginning with coming up with a solid storyline, first, that conveys a concept/premise — and the closer I am honing in on that, the more the individual scenes are coming into focus. Perhaps a little backwards of an approach, but hey, at least I am getting somewhere. Thank you, Lori, for a very clear summation of the Story Grid principles. Please keep up the good work everyone!!! Having an idea about the storyline and then writing a scene that fits into that storyline is a great approach, Amy. My intention with this blog post was to let writers who are new to the Story Grid find a good place to start. But if you know that your brain works better with a global structure then, by all means, use that knowledge to your advantage! I’m curious if you are writing your scenes in order, or if you are writing the obligatory scenes first? Shawn and Tim talk about how to use a masterwork to help you find the key moments (i.e. obligatory scenes for your genre) in a recent podcast episode. It’s called NaNoWriMo and the Story Grid. The process that Shawn outlines in that episode sounds like it might be a closer fit to what you’re already doing. There are many ways to Story Grid! Honestly, my process has been horrible — in other words, highly inefficient, although productive (by my estimation, at least). Remember those art projects, where you push pins into a board in the outline of an object, or what have you, and then you weave and loop strings around the pins, until you create some sort of web-art shape? That’s my process. I ping-pong all over the place . . . I zoom in on details, then zoom out to see the big picture . . . I focus on certain questions, then themes, etc. etc. I’m a bit obsessive, but it really is a reciprocal and back-and-forth type of process, one that is leading somewhere, even though this all sounds like it’s not going anywhere, lol. Anyway, to answer your question: even though I see certain scenes in my mind, I have not committed to writing any of them down on paper yet. I am basically outlining everything first, in a more general sense. After I have my structure and have outlined my goals, I will write the scenes in order, as I believe each scene should have a relationship both with the scene that comes before it and the scene that comes after it. Ironically, the scene writing is the least of my concerns, as they will be fairly easy to write once I know the intention of them. P.S. I am aspiring to write Literary Fiction, with my Primary Story modeling a Hero’s Journey, where the “extraordinary world” is a story unto itself with two sub-stories that complement each other and which could be books of their own. So kind of complicated and intricate. I need to make sure everything is lining up . . . that messages and themes, etc., are clearly stated, reasoned out, and consistent. Thus, I am not ready to write full-fledged scenes yet, nor can I comprehend the idea of writing them out of order, once I begin writing them. Sorry for rambling. Oh . . . the “obligatory scenes and conventions” I am modeling my story on are based more around the hero’s journey structure. In other words, I need a “call to adventure mission scene,” etc. So by working out the mission, the reward, the challenges, etc. I am navigating the trajectory of my plot without actually writing the scenes. It’s more like . . . I am creating general place-marker scenes — the details of which will be finessed once I get deeper into what the scene needs to accomplish. Hope that makes sense. Outstanding overview of Story Grid principles! I notice that your website address is in faint gray letters on my screen. I almost missed it. Hi Christopher, There are many ways to tackle the writing process. Thanks for sharing how you are experimenting. Kudos to you for noticing that something wasn’t working and trying something different. Well done and helpful. Do the same principles come into play when writing from the 1st person? It seems as if a 3rd person omniscient POV allows for more development of a character’s intention. I’m writing a novel in the 1st person and it seems that things unfold in front of my character. Of course, I could be looking for an excuse to not have to go back and rewrite all of my scenes. LOL. Thanks for the piece. Hi Doug, Glad to help. The same principles apply no matter what point of view you are using. When we talk about a scene shifting (i.e. working), that shift doesn’t need to be specifically stated on the page. It’s something that you, as the writer, or your editor, can pinpoint by analyzing your scene. Whatever POV you use, you have a lot of options to *show* the readers your character’s intention. You can use dialogue, body language, character action, metaphor and sensory details, or their inner monologue. For example, let’s say you’re writing a novel with a love story subplot. You can show romantic interest through how close the lovers stand to each other, or how your narrator notices details about their love interest and stops paying attention to their surroundings, or how long they look into each other’s eyes. We *know* what those things mean. LOL. Ever since I read Anders Ericsson’s Peak, I’ve been puzzling about what constitutes “deliberate practice” for a writer. Thanks for this post! Way to go to the source, Beth! I first learned of Ericsson’s research through Malcolm Gladwell’s Outliers and Daniel Coyle’s The Talent Code a few years ago. I haven’t read Peak yet. Thanks for the reminder to put it on my reading list! Freakonomics had a really good discussion on that 10,000 hours, and whether it’s just 10,000 hours, 10,000 hours of deliberate practice, or 10,000 hours with professional feedback. Good stuff. Thanks for writing this article! Thanks for an excellent sum up. Can you explain more the values in war story. Power vs Impotence is probably, “Can we make do anything?” Righteous vs Immoral is probably, “Is it right to do this?” That’s always skewed in a war story because in any other context, the destructive actions would be most immoral. But what is “brotherhood vs. servitude”? They sound similar. Or maybe servitude may have something to do with whether you’re drafted vs volunteering. So what do you mean by brotherhood vs servitude? Hi Wayne, I asked your question about “brotherhood vs. servitude” in the Story Grid Editor group so I could give you a clear, succinct answer. Brotherhood and servitude are two different attitudes that soldiers can have towards fighting. They can fight because it’s their job (servitude) or they can fight because they don’t want to let down the person next to them (brotherhood). Although I loved the blog, I have to take exception to the idea that your input is “too inside baseball.” I’m a new writer (yet to publish my first novel), and have learned a ton from reading the book and listening to the podcast – which I discovered a couple of months ago and have been listening to regularly from the first podcast. That’s not to say that more info from different perspectives isn’t helpful. Thanks for all the hard work. Thanks for sharing, Jessie. I recommend the book and podcast to new writers all the time. I’ve found that the podcast works best when you listen to a lot of it. The back and forth between what Tim writes and Shawn’s feedback is where the magic is, IMO. The goal with these new blogs is to create succinct reference articles on important Story Grid concepts. It’s great to have hours and hours of content, but sometimes the cliff notes are what’s needed. Both to refresh my own memory and to give a quick intro to a topic for an editing client. The way to learn global story telling is first to outline stories so that you can practice getting the whole story arc in. I don’t agree that you write a scene and then see what comes next as the article writer says). You can do that, but it teaches you nothing about global story telling. You can repeat the global story telling process quickly many times by outlining so it is a much better way to practice this skill. The second thing is to analyse stories and see to what extent they fit the models. I did this by analysing books and movies using the plot synopses on IMBD and Wikipedia and it made me question the basic 3-act method which most writers use and turn to a five act model (which I later realised Shakespeare used). I would look up a synopsis and try to find the 14 points in James Bell’s structure. It gave me a much better understanding of the way Crises and Catastrophes work and ultimately also caused me to alter the model in a way that I thought fit better. I 100% agree with you that outlining masterworks is a great way to learn global storytelling. Especially at the level of the whole story arc. However, global storytelling is like those Russian dolls that are nested one within another. The 300,000 foot view of the global story arc is only one level. There are also arcs within the Beginning Hook, the Middle Build, and the Ending Payoff. And then within each of those larger sections of Beginning Hook (or Middle Build, Ending Payoff) there are arcs within sequences of scenes. Looking at “what happens next” is more appropriate for the level of sequences of scenes. Very thought-provoking ideas! What are the obligatory scenes for a low fantasy drama which includes some elements of a love story? Where can I find a full list of obligatory scenes for each type of genre? Hi Susan, For the love story there is a podcast episode where Shawn lists all of the obligatory scenes and conventions. Here is the link. I’m not sure what you mean by “low fantasy drama”. Can you say more about that? I’m a new writer learning a great deal by studying the Story Grid workshop videos and reading the book Story Grid. However, these posts will help me practice what I’m learning through ‘deep practice’ (a Daniel Coyle term). Thank you very much for keeping us beginners in mind. Thanks for sharing, Bill. Hope your ‘deep practice’ is enjoyable and fruitful. Thanks, Lori, for this great post. I particularly value the straightforward advice on articulating the story spine. I struggle with this when people ask me what my novel-under-construction is about, and the three sentence approach you suggest above should help me with that. Looking forward to hearing more from our new certified Story Grid editors! I can’t really take credit for that advice, Sheila. It’s something I learned from Steven Pressfield’s blog which is what I’ve linked to in the post. Steve Pressfield credits Paul Schrader, the screenwriter, for the idea, so it’s advice with a long history. I’m glad you enjoyed the post and hope the story spine advice helps you wow people when you talk about your novel. Thank you Lori for a very good synopsis of beginning with the Story Grid. Where does one get a developmental editor for a completed manuscript, that you mentioned? You’re welcome, Antoinette. There’s going to be a way to do so through the Story Grid website coming soon. In the meantime, you can connect with any of us Certified Story Grid editors through our own websites. (I’m at loripuma.com and would love to chat with you.) If you’re in the Story Grid Workshop class, you’ll also find several Story Grid Editors in the Facebook group associated with the course. I have just finished writing out my one sheet outline, something I would not have been able to do earlier because I had no idea where the story was going to go until it did. Most of the time when I write it is as if I am being dictated from something much beyond my conscious mind with the characters springing into my mind as Athena sprang from the forehead of Zeus. I did not even like them when I first began writing down their story. But now that I have some idea of it’s beginning and end it is much easier to put them on paper. Now I can go back and do things according to the grid – hopefully. 1)What is the desire to the character(s) in this scene? This helps ensure that each scene has that shift you’re talking about. I really enjoyed reading this article as well, I’ve learned a lot, especially the global storytelling part. Thank you! That’s a great approach, Barbara. You can’t go wrong with Robert McKee. I know that he’s one of the sources that Shawn drew on to create the Story Grid. Glad you enjoyed the post. Thanks for taking the time to comment! Honest self-analysis that will only benefit us all. This is the best resource for writing I’ve ever come across.